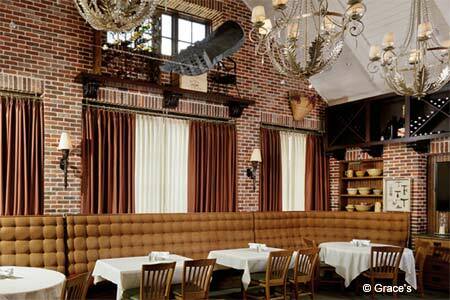 Johnny Carrabba restaurant offering classic Southern and American cuisine. : Johnny Carrabba rounds out his restaurant empire along Kirby Drive with Grace’s, named for his grandmother and offering classic Southern and American cuisine. The comfortable, homey space has several private dining rooms and a large patio with couches and umbrellas. Inside, the décor evokes a grandma’s house, complete with large fireplaces, antique cookware and dishes, and a wall-hanging of delicate lace. The menu, comfort food with many items based on the real grandmother’s recipes, includes a few pasta dishes, a Chinese-inspired chicken and even a shrimp burger on a pretzel bun. But Grace’s really shines with old-style fried Texas quail smothered in jalapeño gravy, lamb chops, Wagyu strips and beef stroganoff with house-made egg noodles and beef chunks. Weekend brunch starts early with frozen mimosas and buttermilk biscuit dishes that include a plate-size chicken fried chicken and gravy sandwich and a chicken potpie with biscuits instead of pastry crust. Sweet lovers will relish the lemon meringue pie and blackberry crumble. There’s a full bar and very reasonably priced wine list that includes a Girard red blend from Napa that pairs well with that beef stroganoff.